The Hot Dog Truck: BEST FISHING TRIP EVER! I have been fishing since I was about 6 years old. Fresh water, salt water, it doesn't matter. I prefer the sea though. Sunday my dad, my son and I chartered a boat to go out and get some STRIPERS. The trip was AWESOME! 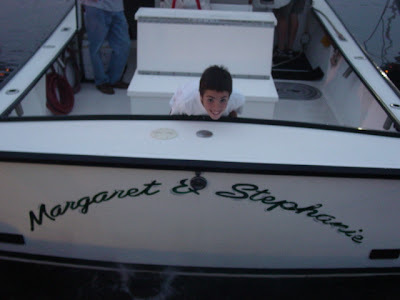 We went out on the Margaret and Stephanie out of Fairhaven, MA. Captain Pete Midurski. We met Pete on the dock at about 5:30 AM and he was talking to some of his fellow boat captains. As we approached Pete, one of his buddies set the tone by saying "If you're going out with Pete, I hope you brought your own gear and a Bible!" Pete told us to stow our gear on "the white boat." Been to a marina lately? THEY'RE ALL WHITE. Too funny. So after a few minutes, we're motoring over to Cuttyhunk head on into 2-3 foot seas. It was a bouncy journey and I kept spilling my much needed coffee. It took about an hour to motor down Buzzards Bay to our first (and only) fishing spot of the day off of Cuttyhunk Island, an island at the "bottom" of Buzzard's Bay. We dropped anchor off a ledge and started "chunking," which is bottom fishing with pieces of cut up Poagies. I had my line in about two minutes and WHAM a monster striper was on the hook! We brought him in, bled him and set him aside in the cooler. We were fishing from about 7 AM to noon and did not go five minutes without one of us landing a fish! I lost count at about 25 fish. We kept one more and let the rest go. If we hadn't done that, we'd have been eating fish chowder until 2009! The action was incredible and your's truly landed a 44 3/4 inch PORKER for the big fish of the day. Everything we caught was keeper size (26 inches or more) with most of the fish coming in around 36 inches! We also caught one sand shark and two scup. We were back at the house in time to catch the Red Sox most recent pounding of the White Sox, an 11-2 shellacking that the three of us slept through most of! For dinner we had, you guessed it, Striped Bass! We grilled the filets with a paste of lemon, butter and dill. DELICIOUS and delicately flaky. 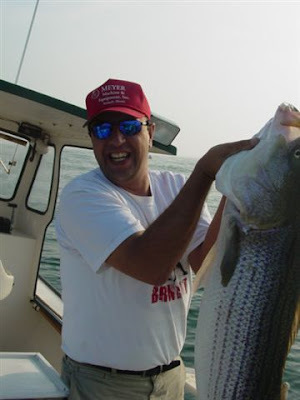 Striped Bass is best enjoyed fresh and it is a good idea to bleed out the fish after catching it before chucking it in the cooler; this keeps it more "delicate" tasting. 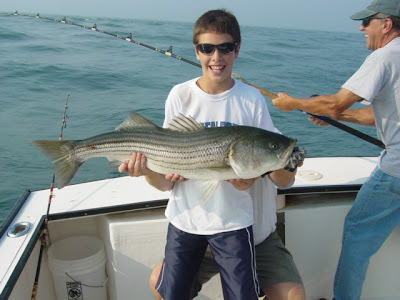 If you are looking for a good Charter Boat Captain, give Pete a call at 774-353-7683, we're glad we did! Just don't forget your Bible. I guess I totally mis-read this post and was looking for pictures of strippers. Although the fishing looked like fun,I am still disappointed. You should check your spelling before hitting the "search" button on Google! We'll do "strippers" on the kid's 21st birthday!